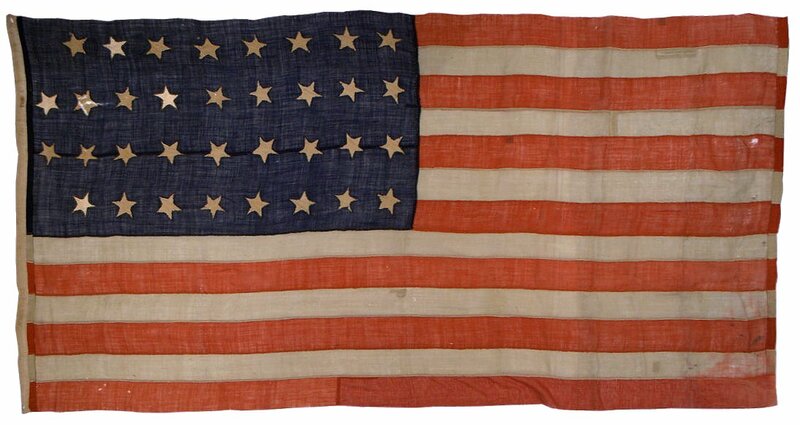 Flags of the American Civil War period are among the most sought after of all American flags. Prior to the Civil War, Americans rarely displayed the flag for personal use. Consequently, flags with star counts of 33 or fewer are very scarce. The events of the Civil War, starting even prior to the commencement of the war with the introduction of Kansas into the Union as the 34th state and the election of President Abraham Lincoln in 1861, marked a turning point in both the surge of patriotism and the production and display of the American flag. Traditionally, Americans begin producing flags of a given star count as soon as the new state enters the Union. Officially, though, the star count on flags is adopted on the 4th of July, based on how many states are in the Union on the 4th. 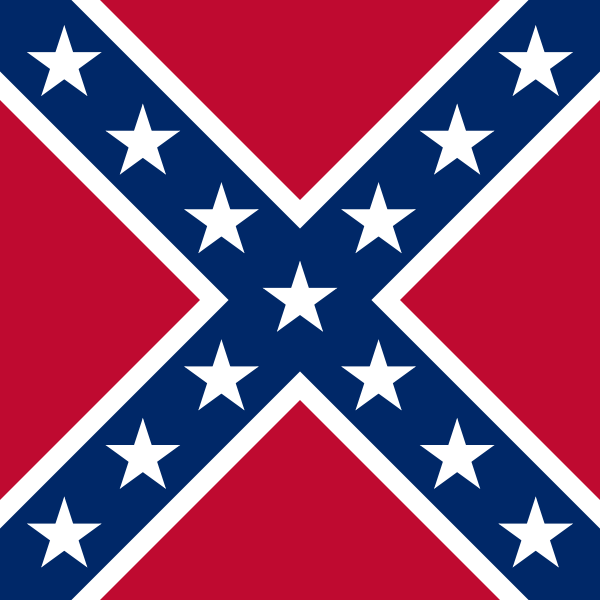 This leads to some debate as to what constitutes a "Civil War" flag. 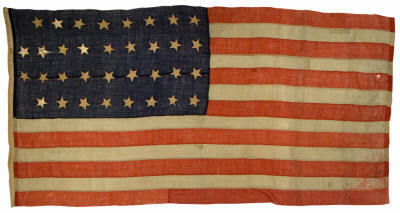 As a collector, I personally consider Civil War Era flags to be those of 33, 34, 35 and 36 stars. Of the four counts, the only one that falls unambiguously into the Civil War military period is 35 stars. 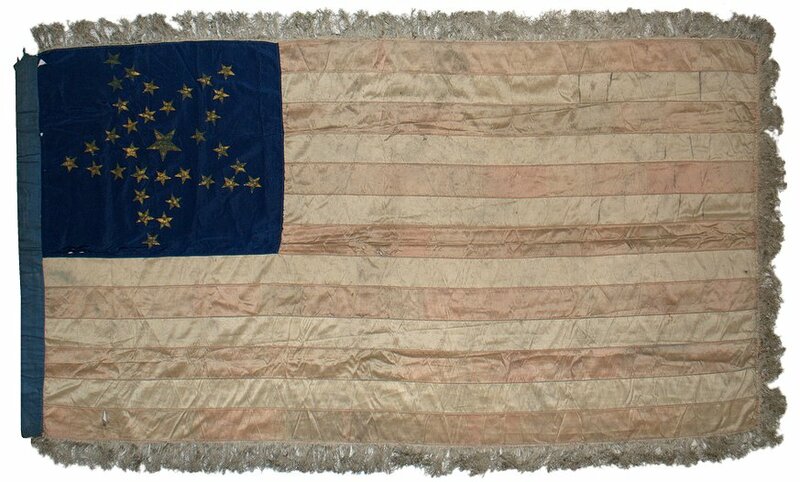 Thirty-three star flags were official during the start of the Civil War, but 34 stars were predominantly produced because of the introduction of Kansas ten weeks prior to the outset of open hostilities at Fort Sumter. 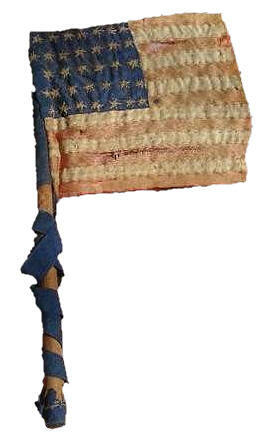 Typically, 33 star flags are associated with the election of Abraham Lincoln, a star count found on many political parade flags of the era relating to the Lincoln-Hamlin ticket in the 1860 Election. Although Nevada became the 36th state nearly 6 months prior to the surrender at Appomattox, the star count did not become official until July 4, 1865, nearly 3 months after surrender. Therefore, while 36 star flags were certainly produced during the war, it's not possible, unless a flag is positively dated in writing or documentation, to place its creation during the military period of the war. Still, flags of 36 stars also represent the beginning of reconstruction and national healing that immediately followed the end of the war. Printed parade flags with overprints of the electoral candidates of Abraham Lincoln's two elections--1860 and 1864--are very rare and highly sought after. Rare examples with various Lincoln portraits in the canton are among the most valuable of all printed parade flags of any era. 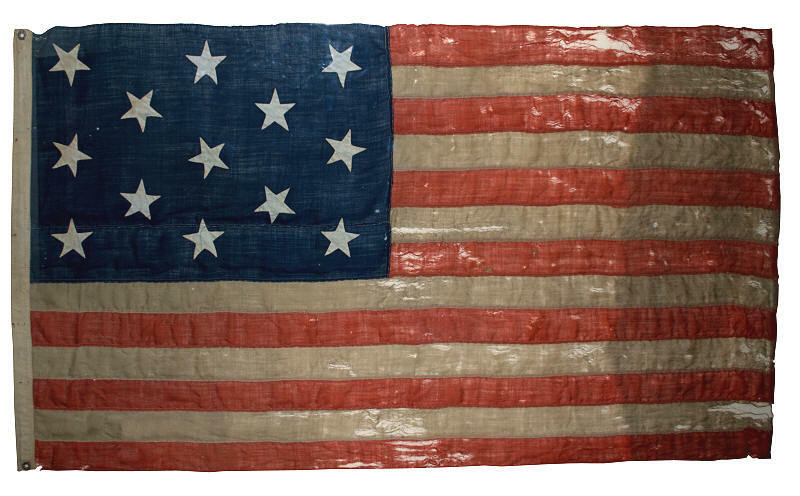 Military battle flags, from either Union or Confederate units, are extremely scarce. Union colors in private hands are extremely rare, since most units turned their battle colors into their state armories and capitals following the war as the units were deactivated. 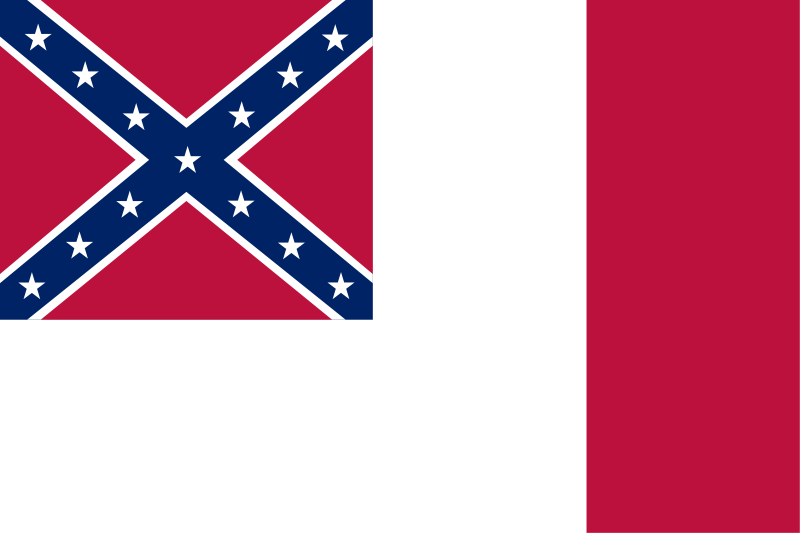 Confederate colors were often taken home following the war, and though they are somewhat more prevalent in private hands, they tend to command even higher prices than Union colors in the open market. 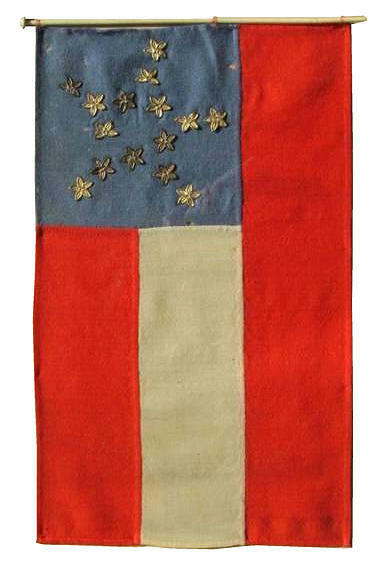 Private sewn flags and parade flags flourished during the Civil War era. Flags were hung on government buildings, at recruitment offices, on businesses and homes. Homemade flags and small cottage-industry flag manufacturers produced large numbers of flags for Americans eager to demonstrate their patriotism. Each regiment typically carried three stands of colors: Regimental Colors, National Colors and State Colors. Company grade units carried their own colors. Often times, these colors were homemade "presentation colors" presented to the unit by the community where the units mustered. Other times, these were official military grade colors issued to the units when they entered the service. Many of these company-grade colors have been lost over time. 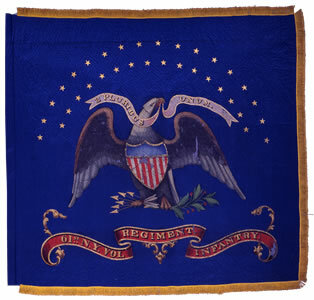 Unlike regimental colors which were ceremoniously returned to state capitals, company colors were rarely turned into the state and were instead brought home with the company units. They often descend in the families of the unit commanders or color bearers. Often they were unfurled at reunion ceremonies, and many were simply lost to time. Military-grade company colors are typically elongated and rectangular, unlike their regimental counterparts which were typically nearly square. Company Presentation Colors, 34 Stars. 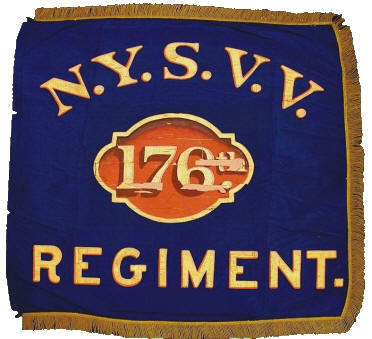 Company A, 16th New York Volunteer Infantry, descended in the family of company commander Captain Isaac Merry. Click here to read more about this flag. Military Grade Company Colors, 34 Stars. Company L, 102nd Pennsylvania Volunteer Infantry, descended in the family of company commander Captain John McFarland. Possible Military Company Replacement Colors, 36 Stars. Unattributed unit, possibly a late war period homemade replacement company colors. The tall, narrow canton and long stripes are in the style of a company-grade union battle flag. The souveniring of a star-shaped portion of the canton is strong evidence supporting military use. Civil War Naval Boat Ensign, Official Size, 13 Stars. 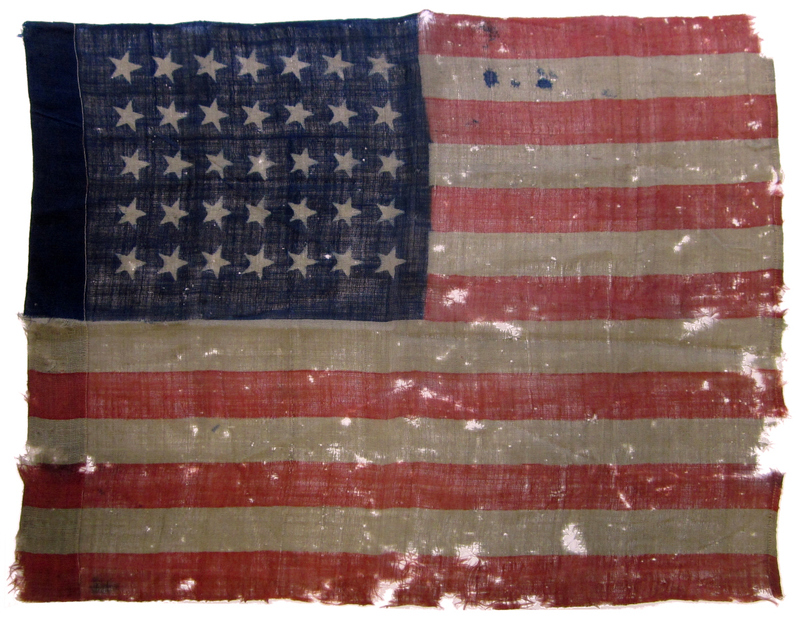 This Naval Ensign from the Civil War era is an official 6 foot as designated by the Navy in the 1863 Naval Regulations .Although its specific history is uncertain, a later period hand written note accompanying the flag references the Battle of Mobile Bay (August, 1864) and quotes Admiral David G. Farragut's memorable (though most likely glamorized) exclamation, "Damn the torpedoes! Full speed ahead!" American National Flag, 34 Stars, Opening Years of the Civil War. 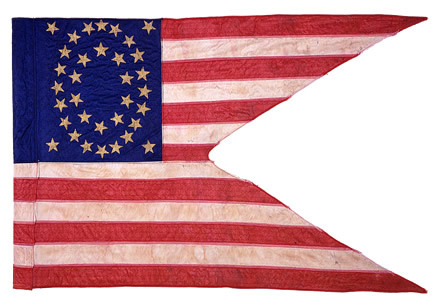 This entirely hand sewn 34 star flag features an elongated canton in a rare 8-9-9-8 pattern. Two spaces remain in the upper and lower left corners of the canton for the addition of new stars. The flag descended in the family of Sergeant Major Daniel F. French, who returned with the flag from Washington, D.C. following the war. Daniel French was a member of Company E of the 56th Regiment Massachusetts Volunteer Infantry. Although President Lincoln urged Americans to refrain from removing stars from the flag in the face of secession, cases exist where stars were in fact removed from flags of the period. Flags of the period with less than official stars leaves open speculation as to the circumstances when the flag was produced. 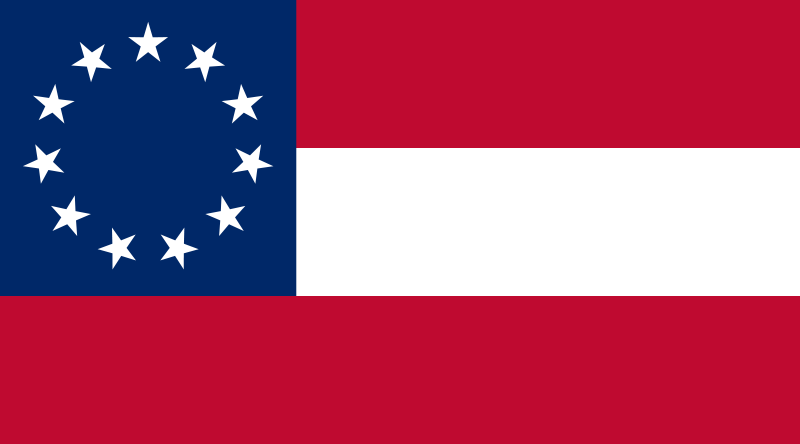 With the introduction of new states into the Union such as Kansas and West Virginia, the incremental secession of southern states, and the presence of territories which were either pro-Union or pro-Confederacy leaning, it's difficult to clearly attribute the precise reasoning behind flags of unusual star counts, such as 23, 24, 25 and others. Still, due to the ability to reasonably date these flags based on construction and materials, we do know that they were produced. 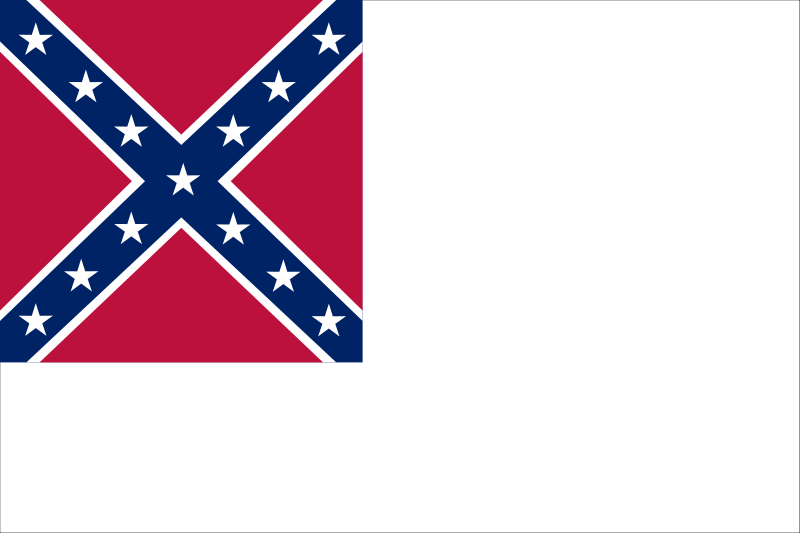 The flags of the Confederacy fall into four major categories: the First National Flag (also known as the "Stars and Bars"), the Second National Flag (also known as the "Stainless Banner"), the Third National Flag (also known as the "Blood Stained Banner") and the Battle Flag of the Confederacy, commonly thought of today as the Confederate flag. 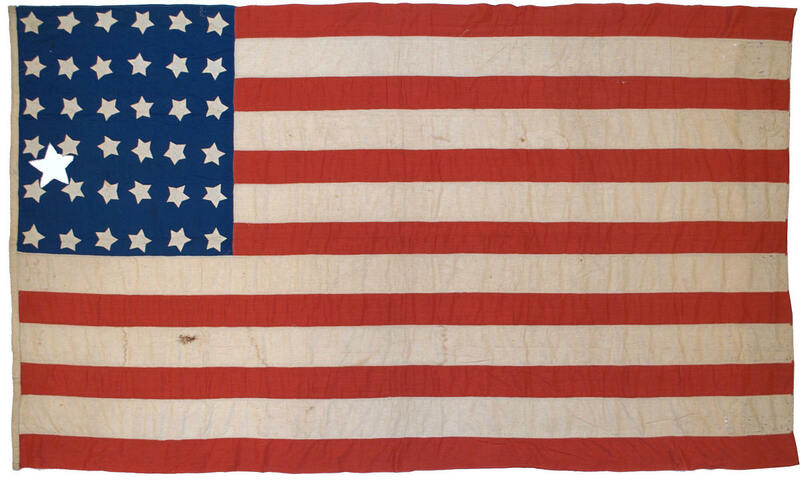 The First National Flag, or "Stars and Bars" (Note: the number of stars changed from 7 to 9 to 11 to 13 as the states seceded between March 4, 1861 and May 26, 1863). 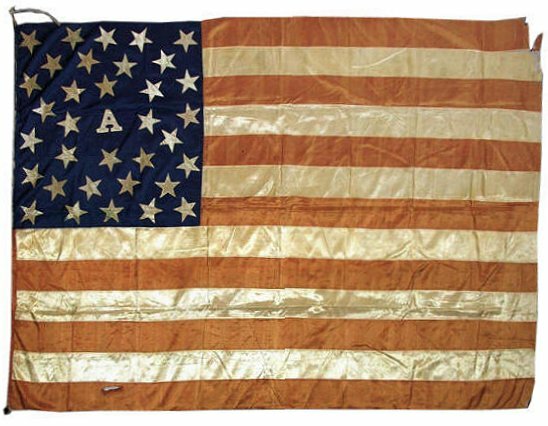 The Second National Flag, or "Stainless Banner"
The Third National Flag, or "Blood Stained Banner"
Many states that are in the process of conserving their Civil War flags have placed portions of their collections online. Some private individuals have also placed images of the flags of their state collections online. 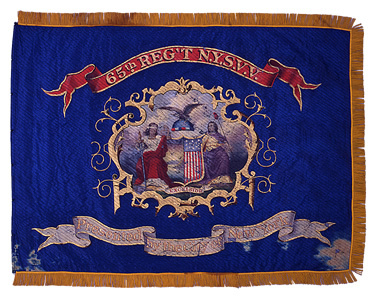 Below are some excellent links to online galleries featuring Civil War flags from the various states. 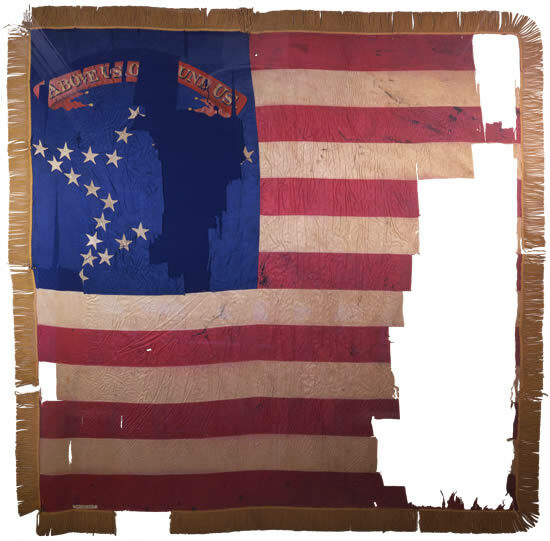 They are excellent resources for flag collectors to gain a feel for what authentic, documented Civil War flags look like. Many sites include images of homemade presentation colors as well as official military-issue stands.